The Korean company Kia began its roots in United States in 1992, with an aim to hit the luxury market and mark its distinct entity. With time company showed immense improvement in presenting its model however till date it failed to achieve the glory it is supposed to. Presenting looks and power better than its sister company Hyundai; Kia recently unveiled its all new Kia Optima 2015 to compete with companies like Honda, Toyota and Ford. 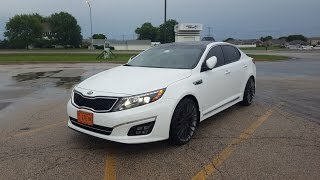 Let us have a close look at the review of Kia Optima 2015 to know what all company has in its box to offer to its buyers. Interior of Kia Optima 2015 is reworked to bring technological and comfort advancements in its lineup. A new steering wheel is mounted over the dashboard featuring company’s name in its center. Also new are two infotainment screens; one in dashboard while another in instrument cluster. Center stack comprises an 8” display while the cluster comes with a 4.3 inch TFT display, with former offering touchscreen to navigate through navigation and audio features. 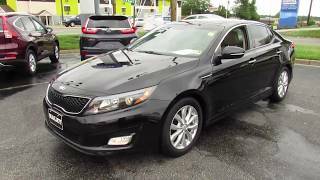 Offering features like blind Spot Detection, Rear Cross Traffic Alert and rear parking sensors Kia Optima 2015 is housed with eight-speakers giving clear and loud sound. Company offers black cloth option for its LX models while the SX gets brushed steering wheel bezels and standard for all models are the cruise buttons mounted over steering wheel. In all the interior of Kia Optima 2015 undoubtedly is a step ahead of its predecessors. Exterior of Kia Optima 2015 comes in Smokey Blue Metallic, Sparkling Silver and Platinum Graphite colors addition in queue. With no change in doors and roofline the front and rear fascia gets round of changes. Front fascia of Kia Optima 2015 gets new LED headlights over the quad-shaped fog lights giving a sharper and luxurious look. Amidst them is the tiger nose grille that gets piano black trim flowing to either side. At the rear end of Kia Optima you’ll notice elongated LED taillights making their way till the trunk lid. 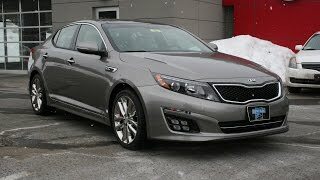 Beneath at both ends you’ll notice exhaust outlets over the black bumper in all making the Kia Optima 2015 look richer and better. 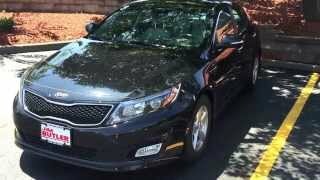 This is where you won’t notice any change in Kia Optima 2015. Model beneath its hood brings same 2.4 Liter inline-four and a 2.0 Liter turbocharged engine. Former comes as standard and generates total output of 192 hp and peak torque of 245 nm. 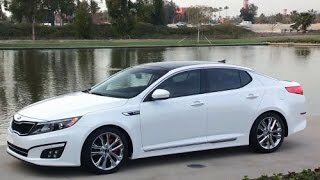 The power output takes the Kia Optima to 60 mph from standstill in 8.5 seconds. However latter four-cylinder generates total output of 274 hp and peak torque of 365 nm and can make Kia Optima 2015 knock the 0-60 mph sprint in just 7.2 seconds. Both the engines come paired to a six-speed automatic transmission featuring Sportmatic clutchless shifting.